Citation: Gross N. The COPD Pipeline, XXVI. The following report comes verbatim from the Food and Drug Administration (FDA) at the end of 2014, “The FDA has approved 35 novel new drugs so far this year, up from 27 products last year, with officials touting 2014 as the best year ever for rare disease treatment approvals”.1 Among these, the only drugs of significance for COPD were olodaterol (Striverdi Respimat) Boehringer Ingelheim’s ultra long-acting β2-agonist ( LABA), and umeclidinium (Incruse, Ellipta) Glaxo Smith Kline’s ultra long-acting muscarinic antagonist (LAMA) dry-powder. Both excellent drugs, but neither of these is a first-in-class (FiC) agent, which the FDA defines as “drugs which use a new and unique mechanism of action for treating a medical condition” and the kind of new treatment so sorely needed to address the problem of disease modification. Cytisine is an alkaloid derived from plants related to Laburnum. Extracts have been used, mostly in Eastern Europe, for many years to assist with smoking cessation. The molecule resembles nicotine and acts as a partial nicotinic acetylcholine agonist. A recent trial5 of the agent versus nicotine replacement showed that sustained smoking cessation at 1 month, the primary endpoint, was 30% more common in the cytisine group than the nicotine replacement group. However, the design was open-label and adverse events were slightly more common in the cytisine group although none were severe. Relapses continued in the months after the primary endpoint. These results are not much different from those obtained by the only other agent of the same class, namely varenicline.3 So why does this agent deserve one’s interest and attention? The answer is in the cost relative to other smoking cessation aids. Cytisine is a natural product and can be obtained at very modest cost, $20 to $30 for a 20-day supply as compared to at least $110 for 8 to 10 weeks of nicotine replacement, and about $500 for 12 weeks of varenicline.5 A commercial form of cytisine, Tabex ®, can be obtained via the internet. However cytisine is not mentioned as the subject of a clinical trial on the clinicaltrials.gov website. According to current concepts of COPD pathogenesis, inflammation is a key component of the developmentof COPD and its persistence, even many years after smoking has ceased. The type of inflammation present in COPD is only slightly amenable to corticosteroid drugs, unlike the inflammation of asthma, and the development of an agent that addresses COPD inflammation is sorely needed. Identification of the pathways that lead to COPD inflammation would enable the development of appropriate inhibitors, and research laboratories and pharmaceutical companies are eager to identify such agents. 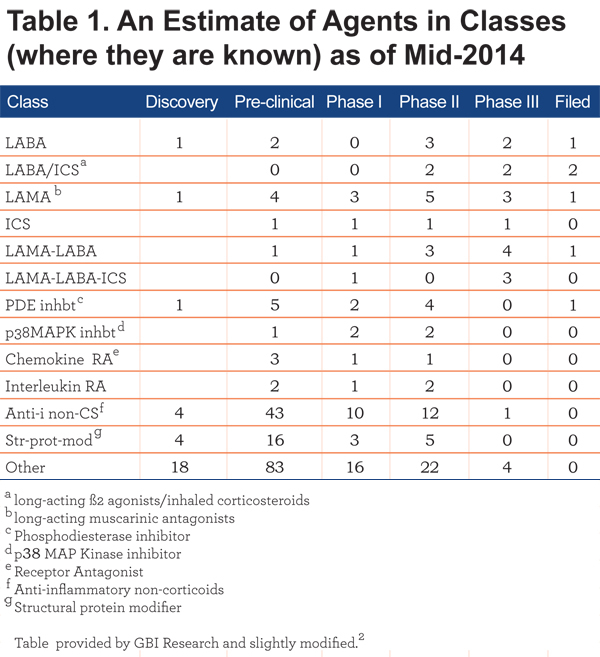 As shown in Table 1, there are approximately 100 agents, mostly in early stage development, with this intent. P38 MAP kinase is one potential aspect of COPD inflammation. The p38 MAPK-activated signaling pathway enhances inflammatory gene transcription. It is activated by extracellular stimuli relevant to COPD such as oxidative stress, toll-like receptor agonists and cigarette smoke. P38 MAP kinase activation is increased in several lung cell types in COPD patients. Moreover, inhibition of p38 MAP kinase reduces production of inflammatory cytokines from alveolar macrophages, lymphocytes and bronchial epithelial cells in vitro, as reviewed by Singh.6 Findings such as these have stimulated the development of p38 MAPK inhibitors as potential treatments for the ongoing inflammation in COPD. Two such agents, both oral, have been in early phase clinical trials for some years. One is Glaxo Smith Kline’s GW856553 or losmapimod. In a 12-week randomized double-blind study, an oral dose of losmapimod, 7.5 mg b.i.d., was compared with an inhaled corticosteroid ( ICS)-LABA dry powder (Advair ®) or placebo.7 The primary endpoint, sputum neutrophils, was not reduced by either active treatment. However, plasma fibrinogen was modestly but statistically reduced in the losmapimod arm; there were also non-significant trends in reduction of interleukin -6 (IL-6), interleukin-8 ( IL-8) and C-reactive protein. Another and larger losmapimod study used the 6-minute walk comparing several doses of the drug (2.5 mg up to 15 mg b.i.d.) with placebo over 24 weeks of treatment. 8 No difference in the 6-minute walk distance test was found for any dose of losmapimod, nor were there trends in improvement of an extensive range of lung function measures, nor plasma levels of fibrinogen and C-reactive protein. In both the above studies, drug-related adverse effects were mostly mild and not significantly more common than in placebo groups. The other agent is Pfizer’s once daily oral agent PH-797804. In a 6-week dose-ranging study in COPD patients, not selected for any phenotype, the primary endpoint was the change in trough forced expiratory volume in 1 second (FEV1) versus placebo.9 Each of several doses resulted in improvements of trough FEV1 that were statistically significant and around 75 ml better than placebo. There were also meaningful improvements in dyspnea index, a modest decrease in the use of rescue medication and reductions in high sensitivity C-reactive protein. However, levels of clara cell secretory protein CC16, IL-6, surfactant protein-D and fibrinogen were unchanged. Some nausea and headaches were seen; otherwise adverse events were not a problem. Oral p38 MAPK inhibitors have been studied for other chronic inflammatory conditions such as rheumatoid arthritis and vascular disorders providing a larger patient pool to observe adverse events. In those trials occasional liver and skin toxicities have been seen. The above trial findings suggest that there may be a role for p38 MAPK inhibitors in COPD, but considerably more work needs to be done to determine their role if any. Some questions that require answers are: What endpoints are appropriate for an agent that addresses COPD inflammation? Specifically, what biomarkers are most relevant? What patient subgroups or phenotypes might be more responsive? Is smoking status a factor in responders? How long must one treat for a benefit to occur? Is 6 weeks or 12, or even 24 weeks long enough? Is it possible that administration of an ICS would enhance the effect of an oral p38 MAPK inhibitor as has been suggested ?10 One hopes that answers to these and many similar questions will be addressed and that this new class of anti-inflammatory drugs will provide the key to disease modification in COPD. 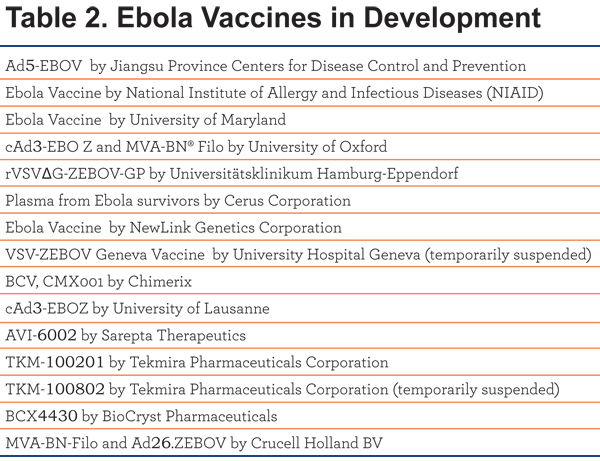 Table 2 is a list of ebola vaccines and their sponsors currently in development as listed in clinicaltrials.gov. These all appear to be unique and in Phase I. 3-D Printing for Lung Diseases? 1. Food and Drug Administration. FDA approves 22 Percent More New Products This Year. FDA News website. http://www.fdanews.com/articles/169066-fda-approves-22-percent-more-new-products-this-year?v=preview . Published 2015. Accessed January 9,2015. 13. 3-D Printing Search results. Wyss Institute at Harvard website. http://wyss.harvard.edu/search?q=3-D+printing&searchSubmit=. Accessed January 12, 2015.